Our family gathered for Easter dinner this year, um, the Saturday after Easter. I guess flexibility is one of our survival skills. Our three kids have in-laws, one baby, two dogs and all three live 1-3 hours away. We are grateful when these kids show up at all, let alone needing them on specific dates. So. Easter dinner. 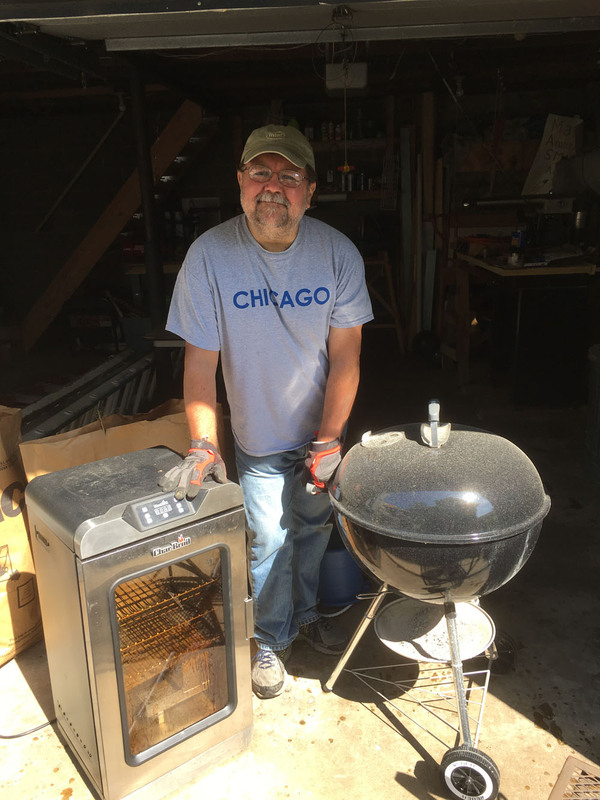 The kids had given Len a new Weber grill for his birthday – which inspired an Easter menu of kabobs. Some marinated and grilled veggies plus a lot of marinated and grilled meat. But because he is Len and I wasn’t looking, he hared off in a direction none of us expected. He created NINE rubs and marinades for the chicken, pork, and beef. And when he served these NINE small bowls of meat for us to mix and match on our plates – he identified them. But not with a simple label… but with the opening line to a novel which will never be written though you can feel the story in your soul as you chow down on the awesome food. I think I have not feted Len’s meat feat enough. Sure, I’ve had these crazy story starts taped to the fridge since April. But it is Labor Day weekend. Time to publically commemorate grilled food. Steakhouse Beef. Easter Day. At the edge of town, under the harsh glow of neon lights proclaiming, “FOOD,” a waitress lit a Marlboro and looked back at a life of sweet promises and bitter disappointments. Hoping to snag a ham on rye for a break-time snack, the Mexican cook surprised her with “Felices Pascuas” and a hearty repast. Jack Pine Sausage Chicken. In the chill of a springtime snowstorm, in the Rhinelander Northwoods, Jacques the Lumberjack bursts into the cook shanty with a couple of squawking chickens. “Grill them up, mon frères!” he cries. The Chicken of Zorba. On a lonely beach, a lonely Englishman pauses, not sure if he should enter the smoky café or take a final walk into the sea. Inside, he meets an immigrant from the island of Crete, who renews his purpose in life and also gives him some chicken. Teriyaki Chicken. Come with me to a mysterious land where the recipes of our ancestors are worshipped and meals come with a tale of the samurai. Look, this piece saved a noble from bandits, and this one carries the whispered urgings of a beautiful Geisha. Teriyaki Pork. “This is our hill!” The high-pitched whine of a Honda Civic is followed by the screech of rubber as the car slides sideways down the steep incline. Following close behind is a Supra with a tuned Acura engine and a stereo blaring K-Pop, carrying a steaming pot of pork. Pork Mole. The white bag of pork is stained with grease and the fingerprints of the grandmother who works in the kitchen. The grandson, who works as the delivery guy for this place, looks up from his community college textbook and reads the delivery address to which he needs to drive it. As he walks toward the Ford Taurus, he thinks of the future that lies ahead of him. He sees the set of 26’s on the car, and smiles. It will be a good ride. Peppercorn Beef. A happy chef, a Turkish chef, wipes his hands on his apron and glances at the picture above the grill. It is a newspaper photo of a popular movie star, but she seems to be staring straight at the chef and he smiles. Dreaming of a night of love, he adds another dash of pepper, recklessly, and starts to whistle. Chili Coffee Beef. The sun is rising, it is the beginning of a new day and the end of shift for two policeman in Waukesha. They have worked with one another for years, and they turn without saying a word into the small café. The other patrons barely look up, the counterman doesn’t need to ask them what they want. But, with respect, he places a linen napkin in front of each of their plates. Even a vegan could be enticed to partake with these literary labels. Wonderfully delightfully irreverent and amusing! Thank you for sharing Len’s humor! Made me smile. Your family dinners sound very entertaining. Love this photo - it captures Len perfectly! What a fun day this was, I can feel it when I read this. Meat themed gifts......I remember a birthday duck!